Sam Jones, the host of Rogers State University in Claremore, OK, along with Emily Spivy, Producer-Director of the television program "Perspectives" have just completed a 30 minute video of me and my career as an artist, both as a Commercial Artist and Fine Artist dealing with over 50 years of painting with watercolor. A very complete coverage of how I became interested in art as a youngster and applied that interest to provide a life-long career in the world of art. I am honored to have had this opportunity to allow those of you who are interested in my art to know more of the journey I have taken in the development and progression of my career. I greatly appreciate this recognition of my efforts and my focus on creating meaningful images of art through watercolor painting. I hope you will take time to watch this professionally completed program. Yesterday, Sunday, October 20, 2013, Linda and I visited the Brandywine Museum Art Center in Chadds Ford, Pennsylvania. It was a perfect autumn day, the colors of autumn all around us. We had been to this museum in 1991 and knew someday we would return. 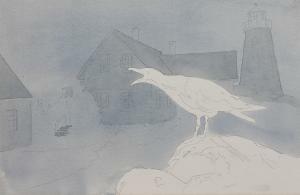 As part of our tour we viewed the works of the Wyeth's then rode a small tour van to visit the home and studio of Andrew Wyeth. We went from there to Carl Kurner's farm a few miles away. It was an extremely emotional time for me to see those two locations. Andrew is my hero, I have followed his career since the early '60's, I admire his works greatly. What a moving experience it was to be exactly where he was, where he worked all those years,to see the images he created from that very spot, to see the tools and materials of one of America's finest artists. It was a trip to Mecca for me, I shall long remember yesterday. I just received a call from Ray Rothgeb, President of the Independence Historical Museum and Art Center, Independence, Kansas, informing me one of the three original watercolor paintings I entered in the 2013 Verdigris Valley Art Exhibit titled "Sepia Afternoon" won "BEST OF SHOW". The 15" x 22" painting was completed using only one color (sepia). The image is of the Pemiquid Point lighthouse on the coast of Maine. I am very honored to have one of my paintings selected for this prestigious award. I will post a photograph of the painting if and when one becomes available. I like painting with the earth tones. A couple of years ago I decided to try painting just using the primary colors of red, yellow and blue. Other than many, many years ago, probably back in high school, I believe this painting is the first using just those colors. I was pleased with the results. It has a freshness about it, clean. Even the dark tones have a bit of color in them. This is probably the most colorful landscape I have ever painted. I found this experiment to be very useful for me, it gave me a stronger sense of color and the mixing of colors. Since then I have included the limited pallet in my beginning watercolor workshops. My students have benefited from trying this approach in their paintings. Frisket is a masking fluid. It is applied in an area to keep paint away. A "true watercolor" doesn't contain white paint. The white is the paper. 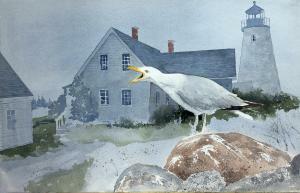 A watercolorist can "paint around" leaving the paper white or use frisket to mask off areas. A third technique is to scrape in the damp painted area to expose the paper underneath. I used a lot of frisket in this painting, experimenting not only with "saving" the whites, but also using it to "save" other colors. The most helpful thing I learned in the experimenting was to thin the frisket with water prior to its application, making it so much easier to apply. Many of my paintings are made up of "elements," reference material images combined together to create a total image. 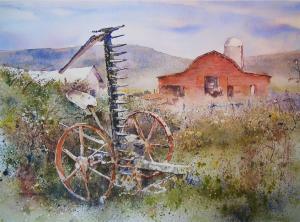 This painting is a combination of a barn from Kentucky and an antique mower from Harbor Village in Grove, Oklahoma. The finished painting almost a month later. I started this painting at the Bartlesville Art Association meeting on the 15th of January. I had about an one hour of work in it by the time the session was over. I posted the image of that evening's effort in a previous blog. The image on that blog is a good example of what I refer to as the first stage of a watercolor painting...at least the approach that I take. From there the painting is brought more into focus with adjustments of values as well as a great deal of additional detail. People are very interested to learn how long it takes to paint an image. It can vary so much, depending on the size of the painting and the amount of detail set forth. I have maybe 8-12 hours in this piece, including the time with the Bartlesville session. What a great time Linda and I had at the Bartlesville Art Association's monthly meeting last night. About 50 folks braved the cold to watch as I painted a winter landscape while demonstrating the use of watercolor. Their meeting began promptly at 7:00, I began painting at 7:20 and continued to 8:20. I have posted an image of the painting thus far. "January Brunch" will be its title. As I mentioned last night during the painting process, it wasn't my intent to paint a full sheet painting as fast as I could during this demo. I chose the 22" x30" size to allow those attending to be able to see the process better. 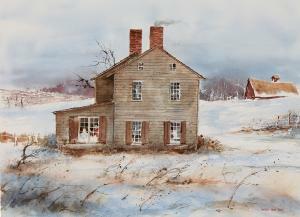 The subject matter was selected to allow for several kinds of techniques to be utilized, a sky for fluid washes, a house for some detail and textures, and of course a wide area of snow to advance the painting to fit in the brief one hour time period. It has progressed very well to this point. I have some areas to define, alter somewhat, make some adjustments and add more detail. Mainly the piece is unified, the colors work well in harmony and are scattered throughout the painting. I will finished this piece in the near future. It will be posted on my web site, offered for sale as well as offered for selections of prints. Thanks to all who came to watch the demo and for being such an attentive audience. 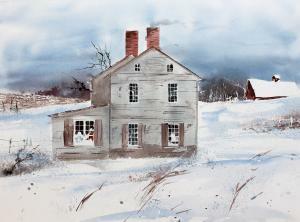 Perhaps I can hold a future watercolor workshop at the BAA. In a fog, part 3. I finished this painting today, signed my name and photographed it. I will post it on my home page in the near future. I'm satisfied with the way it turned out, the gull certainly takes center stage, the background serves to support his image. Originally when I was considering this painting I thought of leaving the "droppings" out, to make the rocks clean and "sanitary." But that's not being honest. To do that would be altering the real world the gulls live in, this is very much a part of their environment. These large rocks serve as perches for just such activity...to scream at anything and everything that needs to be screamed or yelled at. Castine is in Maine, the lighthouse is on the edge of the village. 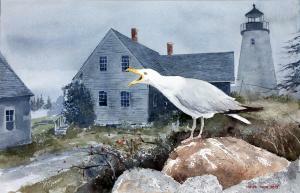 The gulls scream and yell there too. In a fog, part 2. Several things got in the way of having time to work on this painting. But, I have made some progress, even though it is still in a beginning stage. I had applied frisket in some areas, at the windows, some places in the background, but mostly on the the rocks in the foreground. I've painted in on those areas so I could remove the frisket masking. I've found it can cause problems if it is left on the paper too long. I'll have to lighten the shrubs in the background by the brown tail feather of the gull. The feather is getting lost in the background, the values are too close. So far, so good. I'm trying something new with the painting I started this morning. A sea gull is in the foreground, the lighthouse and the lightkeeper's house is in the background. The gull will be in full color with detail while everything else is subdued in a Payne's gray and Ultramarine blue washes. I've uploaded the painting with the initial washes. The first wash was the sky tone over the entire piece. The second is the darker areas on the roof. This might be the opening of a whole new approach for atmospheric content in future paintings. Stay "Tooned"
It's the eve of the new year 2013. I've spent the day in my studio, finishing up a painting I will title "Monday." I've also reviewed some of my previous works and found three images to post in the next few days. I signed on to FAA on November 11th and have been busy putting it all together ever since. I've enjoyed seeing it come together. After an image is uploaded I can't resist seeing what it will look like in the various frame and mat combinations offered. I've already found several of my paintings I'm very tempted to purchase! I put a new picture on my site today of me painting . I've found it is difficult to tell who is a photographer, and who is an artist on these web sites. I hope my photo will say I'm a watercolor artist. I posted my old photo here with the blogs so you can still see what I look like. So a new year is near. My web site is up and running, I've posted new photos of myself, there are many more paintings to be uploaded and that many more to be painted beginning tomorrow morning. 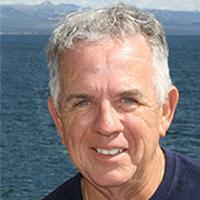 Please pass the word about my web sites, it is the best way to get the word out.